Valentin'es day is the perfect time to get creative and make something beautiful to gift your loved ones. But for us it is yet another reason to get crafty and share some inspirations with you. For all those who fancy a little afternoon crafting before the big day, I have a couple of projects that features two of my favorite techniques : watercoloring and inlaid die cutting. These projects make perfect trading cards to be exchanged among friends. Alternatively, you can display these on wall or adhere to the cover of an art journal! 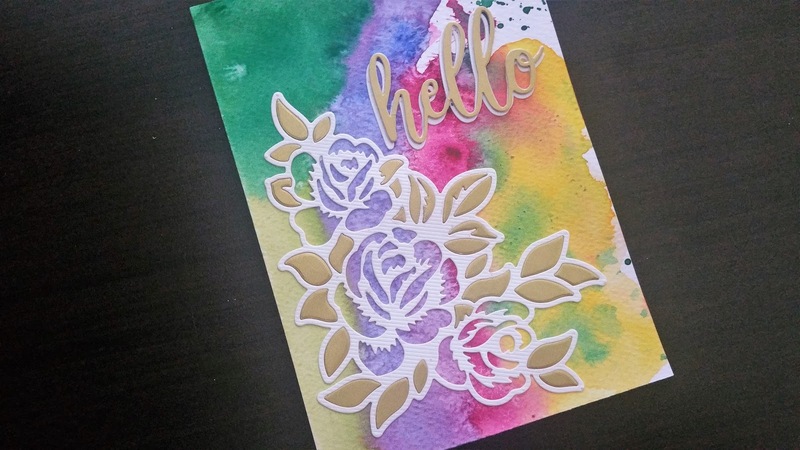 I love the look of the bright watercolor background that Meghana added to this project. Next step was the inlaying technique, which is same as the one shown here. Using the blooming roses dies, I cut once from a white textured cardstock and again from a gold metallic cardstock. I adhered the white petals, piece by piece onto the background and then added the metallic gold outline over it. This is the most tricky and time consuming technique that requires lot of patience. The shadow image of the word "Love" was cut twice from white textured cardstock and layered over each other to give a dimensional effect. 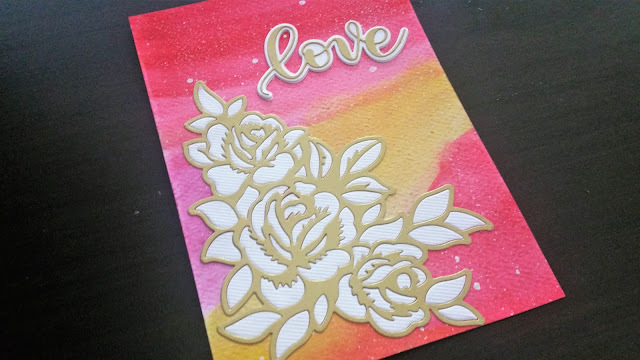 Finally the outline "Love" was cut once and layered over the white textured cardstock. 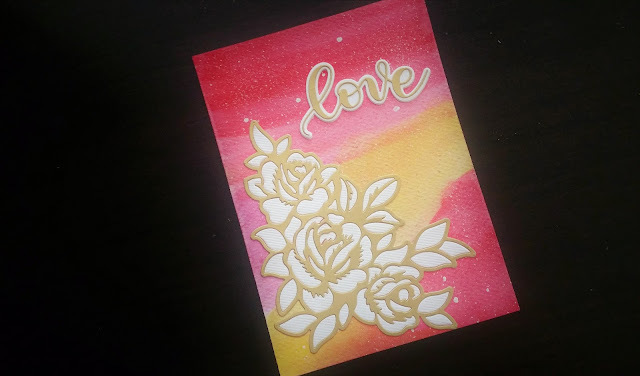 This card was created with the left over pieces of gold metallic cardstock and the outline of the white textured cardstock using the same inlayed die cutting technique. I experimented a bit here by just adhering the golden leaves and leaving the floral images as is, to reveal the beautiful watercolor effect done by Meghana. Finally, I cut the word "hello" from white textured cardstock and gold metallic cardstock and layered them by slightly offsetting the two to give a shadow dimensional look. 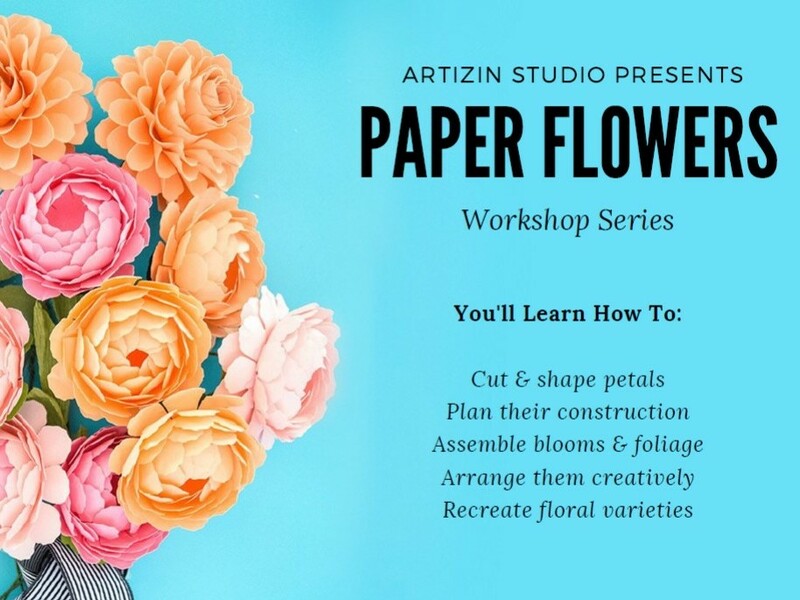 Want to learn more about die cutting and water coloring techniques? Subscribe to our YouTube channel and click on the bell button to get notified when a new video is uploaded. For more ideas and inspirations, follow us on Facebook, Instagram or Pinterest.